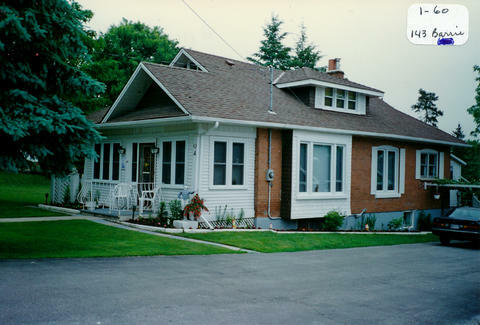 This is the front view of the house located mid-block on the east side at 143 Barrie Street. It was the last house built by Art, Tom and Len Saint after WWI. The building was constructed in 1925 in the Arts and Crafts style. It became the home of many people, including Erv Hill and his wife. He worked for Dennis Nolan and was a noted (Ford) mechanic. Harold Seaurow and his wife (who came from Grand Valley) later bought and moved into this house. Harold was a car salesman and a partner with Wink Crake for a while. He then went with Jim (Catania) and Brad Walker.